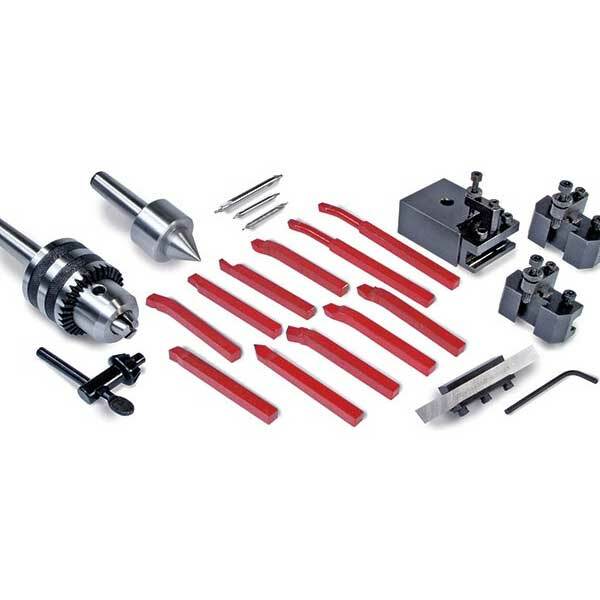 Essential Lathe Starter Tooling Set Gets You Up-and-Running Right Out of the Box! 11-piece Carbide Cutter Set with 5/16 inch square shanks. Jumbo Cut-Off Tool and Holder with super sharp 1/2 inch high blade for heavy duty cutting-off of large diameter stock. 3/8 inch tool holder with black oxide finish fits lathe tool post. Blade is 4-1/2 inches long x 3/32 inch wide. Tailstock Chuck with MT2 Shank holds drills 1/32 inch to 1/2 inch diameter. Includes key. Live (Ball Bearing) Center with MT2 shank. 3-Piece Center Drill Set drills properly contoured holes so workpiece can be mounted between centers. Includes nos. 0, 1 and 2. Quick Change Tool Post includes mounting base with dovetail lock and 3 adjustable holders (3/8 inch capacity) which let you preset tool bits to the perfect cutting height without shimming. Makes tool bit changes quick and easy.